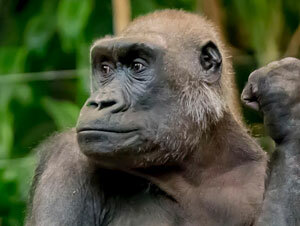 The Milwaukee County Zoo regrets to announce the death of one of its female western lowland gorillas, Naku, on Saturday, April 28. On Friday, keepers noticed Naku appearing more tired than normal, but she was still responsive, and continued to eat and drink. Concerns arise when immobilizing great ape species, so keepers and animal care staff continued to observe Naku closely. (In order to immobilize Naku, her offspring, 8-month-old Zahra, would also have to be immobilized; again presenting significant risks.) Primate staff slept near Naku’s side into Saturday, during which time she showed no signs of pain. After 24 hours of non-stop observation and supportive care, the decision was made to anesthetize her for an exam. Once anesthetized, Naku was found to be septic based on bloodwork performed onsite. Additional tests were conducted while stabilization and supportive care was also performed. Human specialists in ultrasonography, critical care and cardiology were consulted and arrived at the Zoo to assist with care. It was revealed that the source of Naku’s illness was located in her abdomen, so an emergency surgery was then performed by a veterinary surgeon. Surgery showed that Naku had a necrotic bowel, meaning a portion of the intestine had died, and was no longer functioning. Because of the location of the affected intestine, removal of the dead portion and re-attachment of the healthy sections was not a viable option. The animal care staff and veterinary team assessed that Naku would most likely have less than a 10% chance for survival with re-attachment surgery. Rehabilitative care would have meant extended time under sedation for Naku, resulting in a poor quality of life. The difficult decision was made that she be humanely euthanized. She was 17 years old. The remaining family group includes adult female, Shalia, youngster, Sulaiman, and Zahra. This group, along with the Zoo’s two adult male gorillas, make up the Zoo’s troop. All of the gorillas are on antibiotics as a precautionary measure, since it’s too early to determine if Naku’s passing is related to adult male, Cassius, who died April 12. At this time, it’s not known whether Naku’s necrotic bowel was caused by a viral, bacterial or environmental situation. All of the Zoo’s gorillas are now in quarantine, and staff is collecting environmental samples from the indoor Gorilla Exhibit for testing. The Zoo is working with its pathology and laboratory partners for results of tissue and fluid cultures from both Naku and Cassius. Full necropsy (animal autopsy) results will be forthcoming and will help determine if there is a link between the cases. The priority for the Zoo’s animal care staff is to work closely with the family group, in addition to monitoring the health and emotional well-being of the entire troop. Keepers have given Zahra visual access to both Shalia and Sulaiman, in the hope Shalia may eventually act as a “surrogate” mother. Keeper staff will continue to be with the family group 24 hours a day, seven days a week, and are skilled in the highly sensitive situation this presents for Zahra – losing both her mother and father. From close observations of the family throughout the weekend, it was decided at this time Zahra may be most successful with human-assisted rearing. Other zoo professionals that successfully navigated this difficult transition with other juvenile gorillas are assisting the Zoo with this process, and providing valuable support and knowledge. Zahra underwent an exam at the same time Naku was anesthetized, and results showed no abnormalities. Keepers are working diligently to transition Zahra to baby formula, making sure that she’s receiving all of the nutrition she requires and monitoring her for any signs of illness. Zahra’s age allows for both solid foods and liquid formulas to be offered. Animal staff will continue to address both the medical management and the changing social needs of the gorillas. The entire troop will be off exhibit indefinitely until Zahra is completely adapted to whatever situation is deemed best for her. Throughout this entire process, in addition to the Zoo’s own animal and veterinary experts, the Zoo has collaborated with a field of outside professionals including the SSP® (Species Survival Plan) veterinary advisor for gorillas and a pediatric physician, among others. 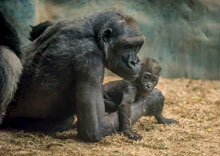 The Zoo is grateful for its collaborative partners and their efforts on behalf of the gorillas. The Zoo will update the media as results are known for Naku and Cassius. For more information, please contact the Zoo’s Marketing and Communications Department at 414.256.5411.